Magma, similar to what spews from volcanoes on Earth, once covered the surface of Mercury, a new study suggests. NASA's Messenger, the first Mercury orbiter, has made its home around the closest planet to the sun since March 2011. From its close-up perch, the probe identified two distinct types of rocks that compose the planet's surface, which scientists were at a loss to explain. Now, experiments in a lab at MIT suggest Mercury's puzzling surface makeup is most likely explained by a huge ocean of magma that existed shortly after the planet formed about 4.5 billion years ago. "The thing that's really amazing on Mercury is, this didn't happen yesterday," Timothy Grove, a professor of geology at MIT, said in a statement. "The crust is probably more than 4 billion years old, so this magma ocean is a really ancient feature." Scientists use images from NASA's Messenger spacecraft to create these global views of Mercury, the most complete maps ever. The images were released on Feb. 22, 2013. Scientists made synthetic rocks in the lab to simulate the two types of material, using finely powdered chemicals to piece together the closest possible matches to what was seen on the planet. "We just mix these together in the right proportions and we've got a synthetic copy of what's on the surface of Mercury," Grove said. The researchers then subjected these samples to high temperatures and pressures to recreate the conditions they might have experienced throughout Mercury's evolution. The analysis pointed to only one possible origin for the two rock types, the researchers said. 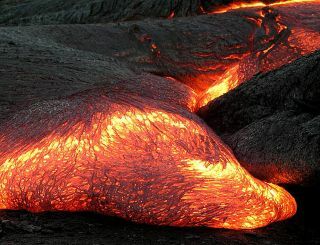 An early ocean of magma created two layers of crystals, which eventually solidified and then re-melted into magma that was spread onto the surface of Mercury through volcanic eruptions. "We're gradually filling in more blanks, and the story may well change, but this work sets up a framework for thinking about new data," said Larry Nittler, a researcher at the Carnegie Institution of Washington. Nittler led the team that originally identified the two rock types on Mercury, but was not involved in the MIT laboratory study. "It's a very important first step toward going from exciting data to real understanding." The scientists detailed their findings in the Feb. 1 issue of the journal Earth and Planetary Science Letters. NASA's Messenger spacecraft (the name is short for MErcury Surface, Space ENvironment, GEochemistry, and Ranging) launched in 2004 on a $446 million mission to study Mercury like never before. The spacecraft completed its primary mission in 2011 and is nearing the end of its first one-year mission extension.